1. The cuts of meat obtained from the rib cages of beef, veal, lamb, and pork. Back ribs are cut from the beef rib primal and short ribs are cut from the chuck and plate. Rib cuts from veal are obtained from the shoulder, rib, and breast primal cuts. 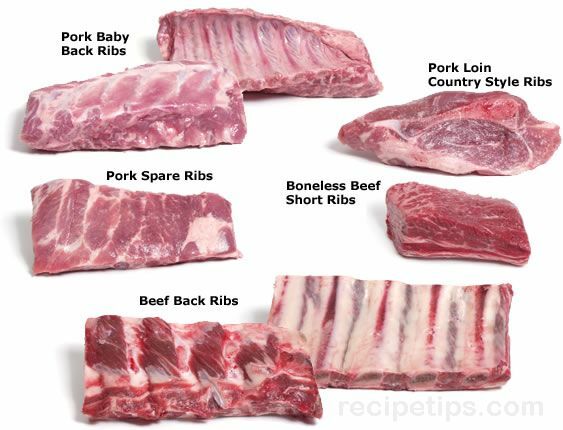 Most lamb ribs, such as spareribs and riblets are cut from the breast. The actual lamb rib primal is reserved for rib roasts and chops. 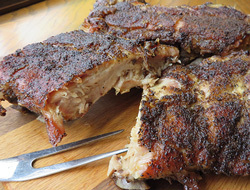 Spareribs and St. Louis style ribs are obtained from the pork side/belly, while back ribs and country style ribs are obtained from the pork loin primal cut. 2. The individual stalks of celery. A bunch of celery is considered a rib by some chefs, but generally rib refers to one single stalk. When preparing ribs, the thin film-like covering on the back side of the ribs can be removed before cooking to improve the tenderness and ease of eating after cooking. Simply place the ribs with the flesh side down and grasp the thin covering with your fingers. Begin to pull the thin covering off, away from the meat, removing it in one continuous layer.